When I think about laid back Mexico, a place where I can relax, get in some snorkeling, scuba, a little beach time and boating, I think of Cozumel. If you haven”t been there, it”s time to discover this little gem. Cozumel is the largest Mexican island in the Atlantic Ocean, but spans only 10 by 30 miles, making the entire island easily accessible. 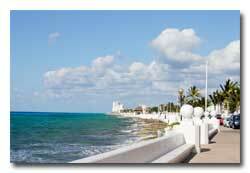 Just 40 miles south of Cancun, Cozumel is more relaxed and secluded. Its pristine waters, friendly shops, bars and restaurants welcome tourists from the world over and provides an authentic Mexico vacation experience. Easily accessible via direct air service to Cozumel Airport or via Cancun, the hotels on Cozumel range from first class to budget, with most located on the west coast of the island, offering spectacular beaches and swimming. San Miguel, the only town on Cozumel Island, provides a fun, beach-town atmosphere with dozens of restaurants and bars and colorful shops selling ceramics and Mexican handicrafts. The Mayans were the first settlers of Cozumel. They viewed the island as sacred and dedicated it to Ixchel, the moon goddess, by building honorary temples. The oldest Maya ruin on the island dates back to AD 300. It is believed that Mayan women made a pilgrimage to Cozumel to “connect” with Ixchel in the hopes they would give birth to healthy children. San Gervasio is the largest remaining Mayan archaeological site in Cozumel. The Spanish conquistador, Hernando Cortes, later arrived in Cozumel from Cuba. Folowing him, many notorious pirates including Henry Morgan made Cozumel their lair. Morgan later became the British governor of Jamaica. Jacques Cousteau visited the island in 1959 and told the world about the beauty of Cozumel”s coral reefs. Cozumel quickly became a popular scuba-diving destination, and diving charters are widely available today. Cozumel”s economy is now tourism-based, offering a safe and comfortable vacation destination. The people here are friendly and service-oriented, providing a much easier and slower pace than Cancun. If you are looking for a laid back vacation, consider Cozumel. 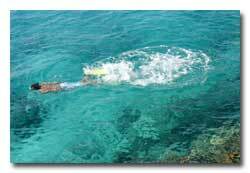 Cozumel is host to truly excellent scuba and snorkeling activities for all ages and skill levels, and the nearby Mayan ruins are also popular. Travelers enjoy the intimate setting and incredible beaches, undersea accessibility, and shore attractions, making this a perfect Mexico destination for anyone, from first-time family travelers to Cozumel regulars. Travelers looking for outdoor activities like diving, deep-sea fishing, snorkeling, kayaking and more will find in Cozumel a paradise awaiting. The territory at the center of the island is mostly undeveloped and covered by jungle and lagoons – an ideal setting for plant, bird, and animal lovers. Honeymooners will enjoy colorful sunsets, walks on secluded beaches, and swims through crystal clear water. The dining is excellent and the nightlife lively, but much more sedate than on the Mexico mainland. A perfect mix of Mexico and the Caribbean and a great way to explore the outdoors, Cozumel is a terrific choice for travelers.